GREAT BAY/MARIGOT, St. Maarten (May 13 , 2014) Can it get more sophisticated, “international,” or symbolic of a “launch” than this? The Opening Ceremony of the 12th annual St. Martin Book Fair will take place at the Princess Juliana International Airport (SXM) on Thursday, June 5, 2014, at 8 PM, said Shujah Reiph, book fair coordinator and head of the Book Fair Committee (BFC). 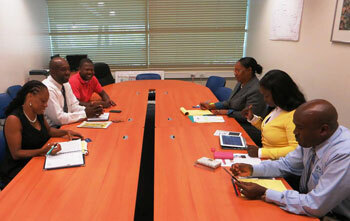 Earlier this week, the SXM Airport Marketing & Customer Service Department representatives met with BFC members to discus plans for the opening ceremony, having new books available on site, and welcoming the regional and international guest writers and book fair lovers of the island,” said Reiph on Tuesday. SXM Airport will also sponsor the book fair’s opening ceremony as part of its own ongoing 70th anniversary as an iconic institution of the island and its people. “A few weeks ago, Ms. Regina LaBega, the SXM Managing Director, generously welcomed the request to have the 12th anniversary opening ceremony at the airport, and she specifically proposed the Gate 1 venue at SXM,” said Reiph. “One of my friends says that the venue has ‘a space-age beauty’ about. It’s a great location for a national event like the St. Martin Book Fair, dealing with our island-wide culture, with literature and books in general, and where visiting guests will meet the people of this Friendly Island,” said Reiph. Authors are confirmed from Turkey, South Sudan, the USA, the Pacific, Puerto Rico, Jamaica, Antigua, Guadeloupe, Martinique, Anguilla/Venezuela, and the USVI, said Reiph. “Over 15 upcoming and famous writers will be meeting with St. Martin people; exchanging exciting books; visiting schools; conducting free workshops; and giving live multilingual literary readings,” added Reiph. “The success with pre-Book Fair activities over the last few years, means that we’ll have that treat again in 2014,” said Jacqueline Sample of House of Nehesi Publishers (HNP). “On Tuesday, June 3, the film Womanish Ways – Freedom, Human Rights and Democracy by Marion Bethel, will have its Eastern Caribbean debut at the Youth Center theater in Sandy Ground, Marigot – as a pre-Book Fair activity. “Womanish Ways documents how women won the rights to vote in the Caribbean, especially in the Bahamas,” said Sample. 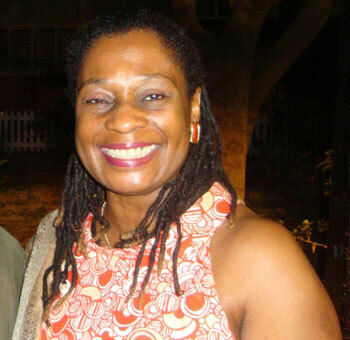 Marion Bethel, an attorney and leading Bahamian poet/author, will be on hand to introduce the award-winning film and take questions from the audience in the movie theater. What else is in store for book fair-goers? The theater workshop will return on Saturday, June 7, the main book fair day at the University of St. Martin (USM), said Sample. The workshop leader will be Dorbrene O’Marde, a playwright of five full-length plays; theater and music producer; and director. The versatile O’Marde hails from Antigua. 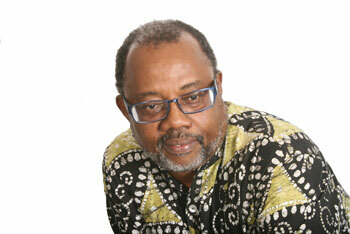 He’s a columnist, and a calypso writer, judge, and analyst. O’Marde’s first novel Send Out You Hand (2012) was followed by Nobody Go Run Me (2013), the biography of kaisonian King Short Shirt (Emanuel McLean). Nobody Go Run Me will be available at the St. Martin Book Fair. The St. Martin Book Fair is organized by CLF and HNP in collaboration with its strategic partner the St. Maarten Tourist Bureau and USM, the LCF Foundation, St. Martin Tourist Office, and SOS Radio.